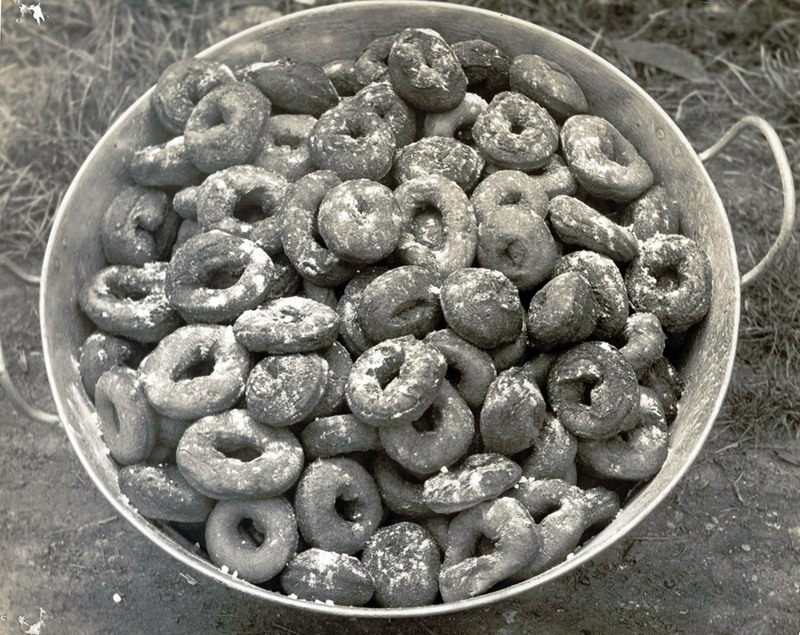 A vat of Salvation army donuts. 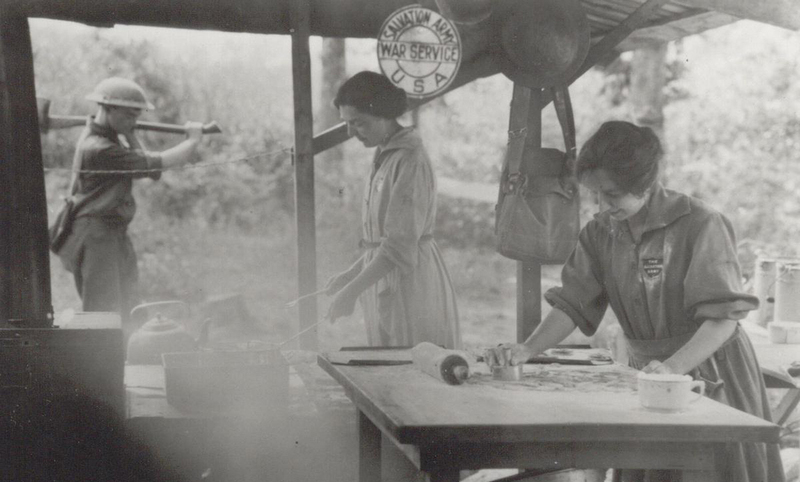 First started in 1938, the first Friday in June commemorates the Doughnut Lassies, brave young women who were part of the Salvation Army's mission to provide emotional and spiritual support to our troops during World War I. Exactly 100 years ago, over 250 volunteers went to France to help. They lived in huts near the frontlines and were there to provide clothing, food, and support for the soldiers. Because of rationing and the conditions of the huts, it was difficult to make baked goods for the soldiers, but some clever volunteers of the Salvation Army (Ensign Margaret Sheldon and Adjutant Helen Purviance ) came up with the idea of frying donuts (7 at a time) in soldier's helmets. The soldiers loved them, it became a big thing, and the soldiers ended up with a new nickname (doughboys). One can probably trace this as the beginning of the American love affair with the donut. 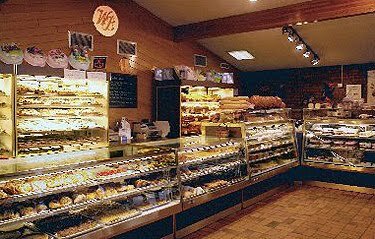 In the Chicagoland area, National Donut Day means some delicious and tasty snacks are for people who aren't soldiers also. And it gives an opportunity to perhaps give back a little also! A desert concept walkup window will offer a glazed bomboloni (a wholeless donut fill with gelato) served with blue Cookie Monster gelato, all rolled in rainbow sprinkles ($7). 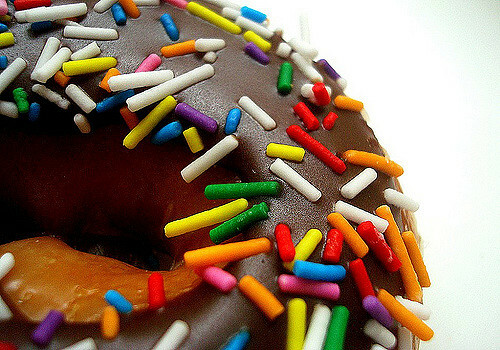 Bridgeview BankThe first Friday of every month is free donut day at Bridgeview bank. Today is an extra special day because it is National Donut Day. Go in to any branch and help yourself to 1 Stan's Donut! The Dapper DoughnutPreviously Beavers Coffee + Donuts- their food trucks and French Market store will offer three free mini sugar-dusted doughnuts. Head to Jefferson Park and buy two doughnuts to get one free. Specials include maple, strawberry with sprinkles, apple cider and chocolate and hot fudge with custard. This coupon is only good at Delightful Pastries. You can try other places. But they will probably not honor it! In honor of National Doughnut Day’s history, the classic bakery will donate 10 percent of doughnut sales on Friday to the Salvation Army. You don't get the deal, but the Salvation Army does. Seems nice to do good by eating poorly! Dunkin’ DonutsThis behomoth among donut shops is offering customers a free classic doughnut of their choice with the purchase of any beverage. 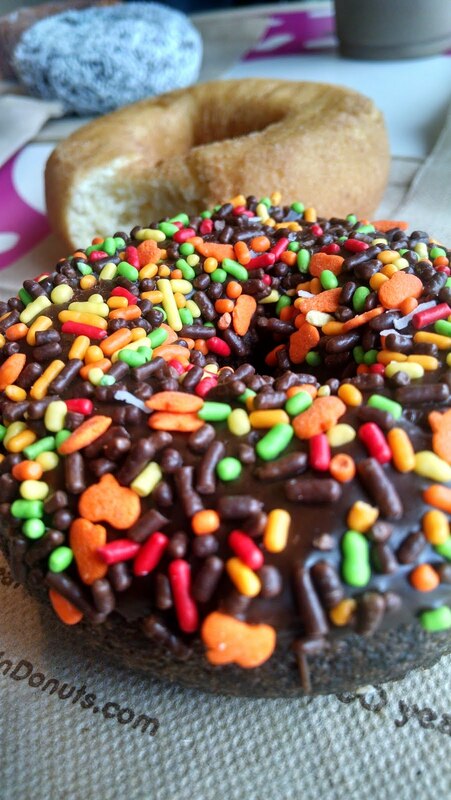 Choose between Boston Kreme, Glazed, Glazed Chocolate and Strawberry Frosted with Sprinkles. Not really donuts, but they are shaped similarly, and I want to encourage fruit eating too! 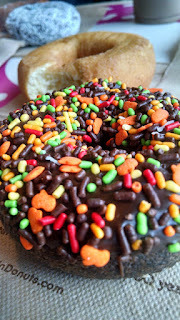 These “Donuts” are really fresh apples dipped in chocolate and shaped into a circle with the hole in the middle, and they feature different toppings like chocolate-glazed, sprinkles, caramelized hazelnut crunch, coconut shavings, and almonds. Swing by any Edible storefront to pick up a complimentary treat on Friday. Anyone who makes a purchase on Friday at one of their locations can enter a giveaway, and prizes range in value from one free buttermilk old fashioned to four dozen donuts and can be redeemed June 2-30. Purchase a pizza from this nationwide chain and receive an order of free doughnut holes for dessert. A new menu addition, these warm treats are coated in cinnamon sugar and filled with caramel crème. If you aren’t craving pizza on National Donut Day, beginning on June 2, you can use the promo code DONUT to add a complimentary side of these with the purchase of any two pizzas through the app. The pizza chain is also holding a contest for one of their customers an eight-day, seven-night, all-expenses-paid trip for two to New Zealand’s Donut Island, which is shaped like a doughnut. Any customer who orders the new Donut Holes online or via the Papa John’s app between June 2 and June 30 can opt-in to the sweepstakes. This charitable organization will be partnering with Entenmann’s, to host a series of “Do Good Donut Parties,” where they will serve over 10,000 doughnuts to 8,500 veterans across America. These parties will be alongside other Salvation Army events, including a Donut Eating Championship in Los Angeles and an annual free doughnut celebration in Cincinnati, Ohio. Weirdly, there's nothing going on in the donut haven I live in , Chicago. Get with it, Salvo! This Belmont-Cragin doughnut shop will be giving away its signature red velvet variety for free with any purchase. Stan’s Donuts & CoffeeStan’s owner Rich Labriola said in a press release that this year, they plan to give away 10,000 doughnuts this year. All locations will offer one glazed donut with any purchase. Wicker Park, Streeterville, Lakeview, East Roosevelt and West Loop businesses open at 6:30 a.m. The Millennium Park store opens at 6 a.m. and the Mag Mile shop at 7 a.m.
Uptown DonutsFrom June 1 through 3, sample $1 glazed donuts and special flavors including piña colada, strawberry shortcake and s'mores. 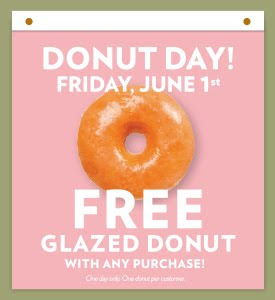 All retailers nationwide are giving away complimentary whole glazed donuts to customers who enter their store on Friday. 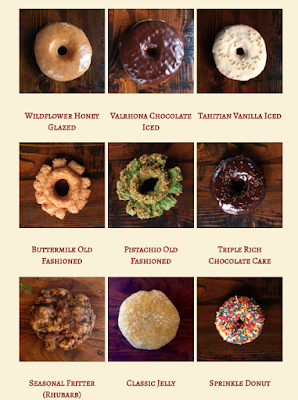 One of the city’s oldest bakeries will offer 24 doughnuts, from traditional chocolate cake (88 cents) to two new flavors: a vanilla long john with Oreo on top (88 cents) and a maple bacon long john ($1.50).